Google encourages you to keep your data in your inbox. But what happens to this data? Many Gmail users like myself rely fully on their Gmail account and keep important documents, pictures sometimes password hints or even (you shouldn’t) passwords inside Gmail. Below I list some problems that may incur if you rely on this service. 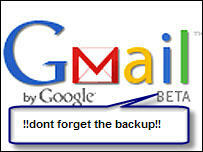 Problem 2) What happens in case of a GOOGLE or GMAIL outage? See my report from the March 27th outage here. Problem 3) What happens in case Google / GMAIL decides to suspend your service? See here for references. a) Set up a redirection to another mail Service like YAHOO. Go to Settings / Forwarded and Pop and enter the e-mail address you want all incoming e-mail forwarded. (detailed help from Gmail here) You can keep a copy in your Gmail account. With this you will have the e-mail with 2 different companies. In case one of them goes down or deletes your mail you still have access to it. b) As an alternative you can use a mail client like Outlook or Thunderbird and download a copy with Pop3. In this way you will have a copy of your mail on a local machine. I will (update did) write about how I got all my Gmail messages in to my new Yahoo account in my next post (see here). Pingback: How to move ( copy ) your messages from Google to Yahoo « anyone need my comment? My son is a programmer/developer but he is getting tired of all my questions. Sometimes he just tells me, “I don’t know, Mom. Why don’t you research it?” So here I am, researching. I will understand if you do not wish to respond to my queries. Pingback: Gmail lost my mail after upgrading service « anyone need my comment? I have lost all my mail and contacts at peruram@gmail.com due to someone hacking my account. How do I get me contacts back or reinstitute my accont? This is why I keep a personal backup (all incoming mail is redirected to Yahoo automatically) A message to all readers DO NOT RELY ON GMAIL OR ANY OTHER WEBMAIL SERVICE – ALWAYS KEEP A BACKUP!!!! so it was in december when we seen the last gmail emails disapering. Well im wondering if its happening again. Like 4 days ago i opened my account and to my surprise and anger there was nothing in, blank, zero procent. All of my drafts, inbox, even deleted items were gonne. Did anyone else latly experienced this? i have wrote all my data in subject bar and send it to some one in short i lost all that data …….can u plz tell is there is any way to recover it?? ?